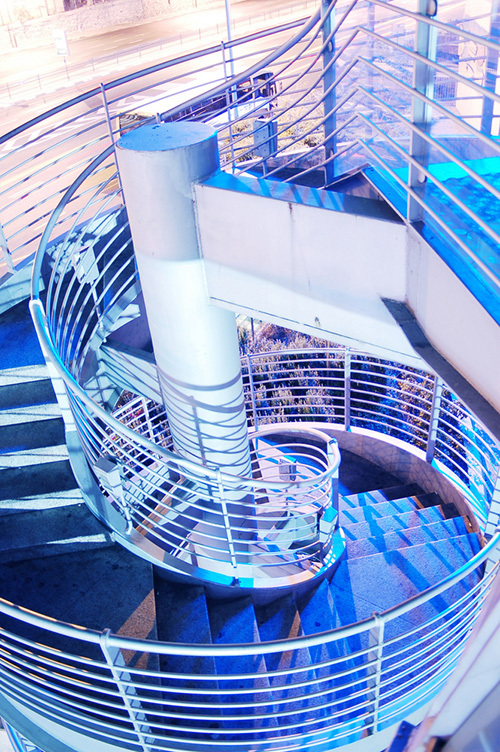 Aluminium spiral staircases make both a beautiful and practical addition to a multi-level deck or patio. Ideally suited for outdoor use, coated aluminum is sturdy, resists rust and is virtually maintenance free. The powder coating is available in a wide selection of colours, so you should not have any difficulty finding the shade that fits in perfectly with your home and outdoor décor. Why choose aluminium spiral stairs? When it comes to outdoor metal stairs, consumers have a choice of aluminium or galvanized steel. While both materials are great for withstanding the elements, many homeowners prefer the look of an aluminium staircase for their outdoor living spaces because it has a less industrial look than steel. And of course, any outdoor staircase must be able to stand up to the elements – and in this area, aluminium also scores top marks, making it the most popular choice of metals among homeowners for outdoor stairs. Whether your home is subject to harsh Canadian winters, or whether you live in a beach community where salt can be a problem, your aluminium stairs will resist rust and corrosion. One of the first things that stands out about a spiral staircase is its aesthetic appeal. Many people choose to go with spiral staircases simply because they admire their unique gracefulness. And eye-catching, they certainly are! But spiral staircases are also extremely practical – especially for areas that are short on space. In fact, a spiral staircase can take up to five times less surface area than a traditional straight staircase. When it comes to your deck or patio, choosing to go with a spiral can mean more room for outdoor furnishings, more space for your barbeque, and a larger area for friends and family to enjoy the outdoors. An added benefit, that some people find surprising, is how easy aluminium spiral staircase kits are to assemble and install. These structures can go up over the course of a few hours – not days or weeks. For the do it yourselfer, installing a stair kit can be a weekend project. Or, if this is outside of your comfort level, installation is a simple matter for a professional. And, for our customers who live in the Toronto area, we’ll even do the installation for you. These staircases are highly customizable, so it is easy for the homeowner to realize their vision. When ordering your staircase, you’ll have options to choose various tread styles and covers, balusters and handrails. You may even choose to order balcony and deck rails that match your staircase. You simply can’t beat Spiral Stair People when it comes to workmanship, quality and value. We have been serving Canadians since 1968 and our aluminium spiral stairs kits can be shipped anywhere in North America. Contact us today to learn how we can help make your vision a reality.